I have a Hermes Rocket that has an interesting story which I'd like to share. I like portable typewriters, though the challenge is finding those with good build quality and feel. About a year ago, a friend of mine told me about his father-in-law who was aging and had to be relocated to an assisted living home, and that many of his personal items would be disposed of, and would I be interested in a typewriter. Of course I would, but thought little about it until, some months later, he produces this Hermes Rocket. Boy was I surprised! The machine was in okay condition, but many of the letters would not advance the carriage unless the keys were hit very hard. After the usual degreasing, cleaning and oiling I ended up adding small brass tubes to the linkages of the problem characters, most of which were in the center of the basket, and now it types beautifully. But about that backstory. The man who owned this typewriter was a US Air Force officer and engineer, who was principal designer of the SR-71 spy plane engines. Threaded up around the platen of this machine when I received it was a seemingly blank sheet of paper that revealed, upon careful inspection with a bright desk lamp, the imprint of some official military correspondence. Nothing secretive mind you, just administrative matters, but an interesting bit of provenance. 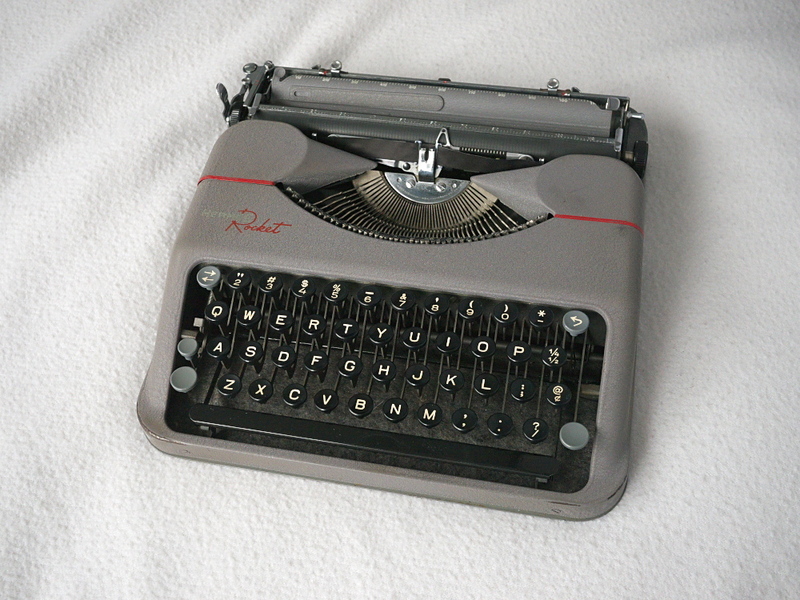 This highly portable typewriter now writes so well that I choose it even before my Lettera 22 or Royal Mercury. Sometimes good things come in small packages. Nice Rocket Joe, and primarily because the graphics and paint appear to be in good condition. I agree with your assessment of the machine and would rank it higher than the other two as well. Have you dated it using the serial number yet? Uwe, it seems to date to 1953. Awww... I like that! I have a 1949 Baby, which is NOT in ncie shiany condition with nice bright red strips and a pristine logo... it has frankly had a bit of a time but I have got it back in use and that's a blessing! Maybe that's a story I could tell in aother thread. But in terms of back stories, I got a Remington Rand No 5 the other week - as per my usual mode, I got it at the last minute for 99p plus postage. (I have to stop doing this! I'm growing a world-class collection of knackered machines that WOULD'VE been really wonderful, if...) The woman I got it from said a relative had bought it new in 1948 and used it daily for almost 50 years. Sure enough, it arrived and is pretty scorched. The paint is almost all off the left side, and the platen is so threadbare that I can see the metal through it in places! And the carriage return lever is a bit wobbly. But interestingly it has a Spanish keyboard. And the serial number placed it in mid-1946. My curiosity was piqued and I wrote back to her asking who the relative was, why they had a Spanish keyboard, and what they used the machine for, for 50 years. She wrote back that it had been her father's. He spent ten years in the 30s and 40s working in the Foreign & Commonwealth Office in West Africa, and then got one terrible fever after another. To everyone's surprise, he recovered - but he was blinded and never saw again. Imediately he recovered he went to stay with family in Argentina and convalesce - saddling up and riding horses to his mother's terror, apparently! Back in the UK he went on a rehab course in Torquay, to 'learn to be blind' (he apparently said he didn't need a course, he had managed that on his own), learn to use Braille etc. He had a very full life after that, marrying his childhood sweetheart and having a full career, and he had this typewriter all that time. His daughter thought it had come from the course, but the serial number and Spanish keyboard seem to indicate that he got it in Argentina. BOY was I glad I had asked for the story! I was practically in tears when I got to the end of her email. It might be almost worth getting the platen rerubberised.